Last night was another night where I wanted to make something with herbs from my garden — in this case, rosemary. I’ve thought for a long time that rosemary and lemon were meant for each other. 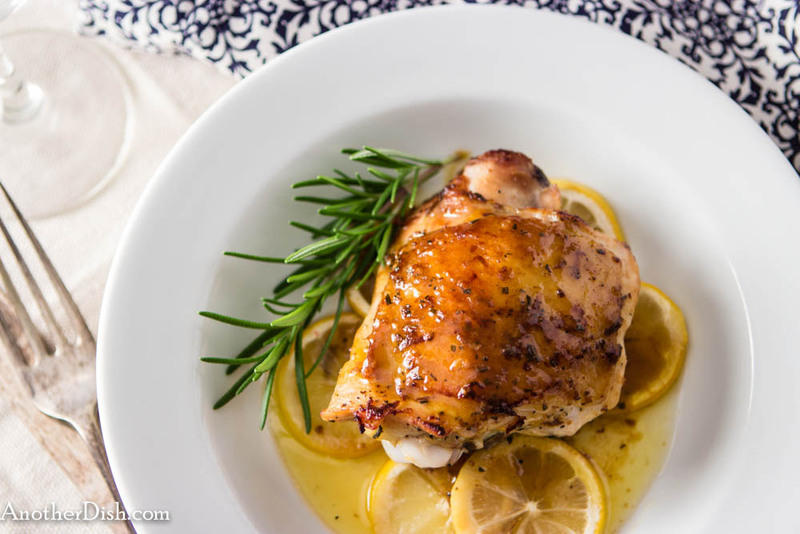 I was also in the mood for chicken, which goes very well with rosemary and lemon, so I decided to make this oven-roasted version of those ingredients — wonderful! The combination of flavors is bright and welcoming. I like to serve this with a wild rice pilaf — hope you’ll try this dish tonight! In a small bowl, combine garlic, 1 tsp salt, 1/2 tsp ground black pepper, lemon zest, rosemary and 1 Tbsp olive oil. Stir into a paste. Place chicken thighs in a shallow dish and rub thoroughly with paste. Cover and let marinate in the refrigerator 2 hours. Preheat oven to 425 degrees F. Line an ovenproof dish with sliced lemons. Heat 1 Tbsp olive oil in a non-stick pan over medium-high heat. Brown chicken thighs (skin-side down first) on both sides, 4 minutes per side. Arrange the chicken over the lemon slices in the ovenproof dish, skin-side up. Place dish in oven and roast 20 – 25 minutes, or until juices run clear when pierced. In the meantime, add lemon juice, water, corn starch, salt and bay leaf to pan that the chicken browned in. Bring to a boil, reduce heat to low and stir until sauce has thickened, about 5 minutes. Remove from heat. Remove chicken from oven, cover loosely with foil and let stand 5 minutes. To serve, place a few of the lemon slices on each plate. Place chicken thigh over lemon slices on each plate and pour some of the sauce over each serving. This entry was posted in Chicken, Italian, Main Dishes and tagged Cooking, Food, Food Photography, Foodie, Italian Food, Recipes on August 18, 2014 by AnotherDish. Once again, it was my overflowing herb garden that inspired me to make this dish — I used to think of sage as an herb you cook with only in winter. I’ve always grown it, but by the time I wanted to use it, it was gone with the first frost. Luckily, I’ve discovered that sage is wonderful year-round. In this simple meat sauce, the sage (together with the meat browned in butter!) provides for a nice depth of flavor! 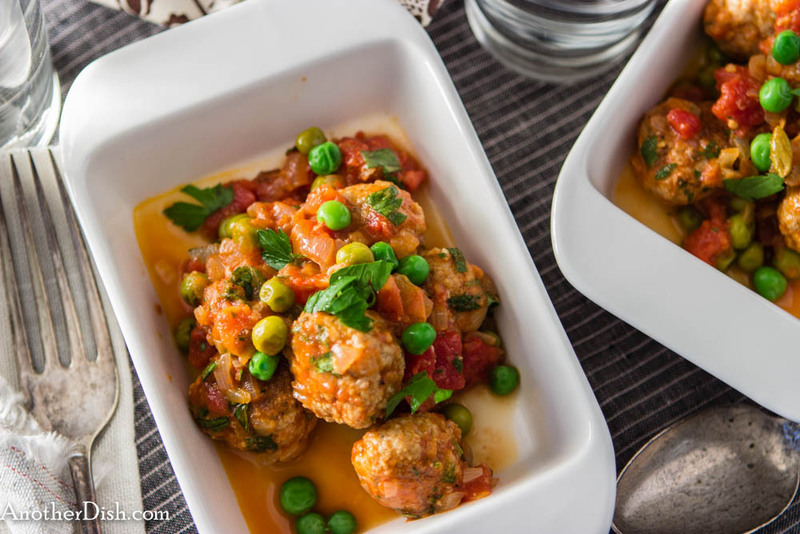 I hope you’ll try this recipe tonight with your fresh herbs! In a large sauce pan, melt butter over high heat. Add beef and brown 5 minutes, stirring constantly to breaking up any clumps. Add onion, garlic, sage, and sprinkle with flour. Stir an additional 3 minutes. Stir in wine, beef stock, salt and pepper. Bring to a boil. Stir in tomato paste. Reduce heat to medium and simmer until sauce thickens, about 20 minutes. Remove sauce from heat. Stir in parsley and season with additional salt and pepper, if desired. 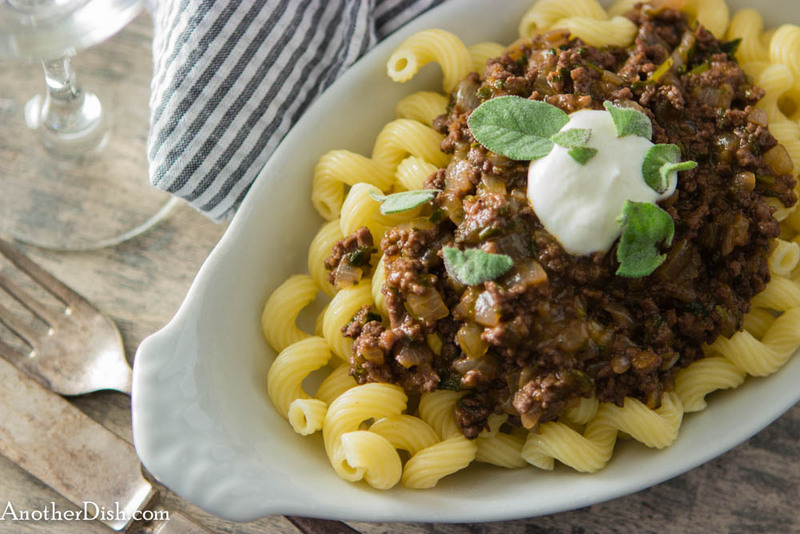 Serve over pasta with a dollup of sour cream. This entry was posted in Beef, Italian, Main Dishes, Pastas and Grains and tagged Cooking, Food, Food Photography, Foodie, Recipes on August 4, 2014 by AnotherDish.